What are Family Learning events? Our Family Learning programme aims to help parents get more involved in their children's learning, in order to understand how their children learn at Hayesbrook. Parents really enjoy meeting our staff and learning how they can better support their child with their homework and coursework. 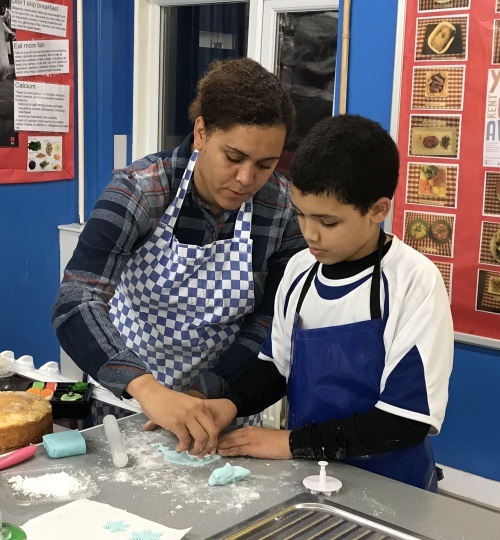 Various activities have taken place that parents have attended with their children including Maths, ICT, English and Design Technology lessons, as well as several cookery sessions and a first aid course. Many families have enjoyed the trips to sporting events, such as premier league football matches, premiership rugby and National basketball fixtures, as well as a 'Dads and Lads' training session with Harlequins. Groups have also visited Thorpe Park, Wilderness Wood along side the Science and Natural History museums in London to experience learning outside of the classroom. A programme of activities and events is always on offer, if you are interested in attending any sessions please contact Mr Upton on 01732 500600 or use the enquiry page. "Great for parents to be invited in, involved & informed. Our son definitely enjoyed it a lot more than he thought he would!" "Great evening at @HayesbrookSch family learning event. Our Year 9 son even asking to go to another one. Would recommend highly "
"This is the best child - parent based activities we have ever taken part in. We enjoyed working together and learning new things, meeting new people, building friendship and having new shared experiences. Highly recommend...."
"We have enjoyed the events so much,meeting other parents and getting to know teachers in then school. It was a fantastic idea that has given me quality time with my son which in todays busy life can be overlooked. It has been such a positive experience for us all. Thank you!" "The days out and lessons have all been great. It was very beneficial to see the things our children are taught at school and gives us adults a better understanding of what goes on." "These events have allowed me to experience things with my son, that we would otherwise not have been able to." "This has been fantastic fun - when can we do it again?"